The “Blog” of “Unnecessary” Quotation Marks: "Happy Holidays"
Given that the holiday special is a single slice of cheese for $1, I think the sarcastic "Happy Holidays" is appropriate. Thanks Grace. In some parts of the country "slice" implies "slice of pizza". 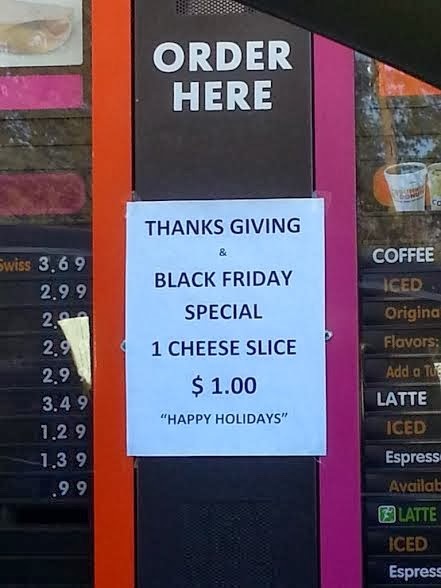 The author of this sign seems to have missed a golden opportunity for one more use: "Thanks" (notably apart from) giving is begging for quotation marks. Slice of cheese pizza is what I immediately assumed it meant, but if it's not called that everywhere then the confusion makes sense.